Himiko the beloved daughter of a chieftain in third century Japan has always been special. The day she was born there was a devastating earthquake, and the tribe's shamaness had an amazing vision revealing the young girl's future—one day this privileged child will be the spiritual and tribal leader over all of the tribes. Book One revolves around the events of Himiko's early teen years—her shaman lessons, friendships, contact with other tribes, and journey to save her family after a series of tragic events. Once again, Esther Friesner masterfully weaves together history, myth, and mysticism in a tale of a princess whose path is far from traditional. The cover: After reading the book, I get that they put some of the book into the cover image, which I appreciate as a reader. I like that they used tradtional dress for the cover model and that she seems fierce and is in action, rather than having a brooding "come hither" look. I don't know what it is though, the book cover seems a little off to me... I think it is because the girl looks like she is playing dress up. The outfit and wig are wearing HER, if you know what I mean? It is a pretty cover though. The Characters: Man were there a lot of characters in this story. Multiple wives, tons of siblings, villagers, other village's villagers- I was concerned I wouldn't keep up. The author did a good job not just mentioning these characters in passing, but showing personality and giving the side characters action scenes. Himiko, the main character, evolved as a character and really grew up in this story. There really is no love life for Himiko- and very little romance. 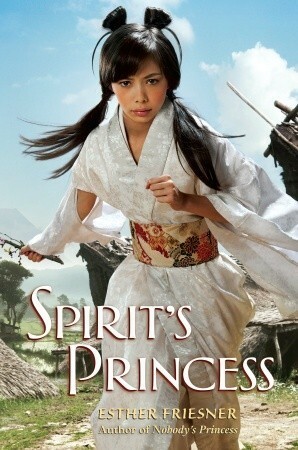 I had a hard time liking Himiko in this book, and had to remind myself that for most of the book- she is only a child. and I thought this book would be a shoo-in. This book drags- there really isn't alot of action. It feels like the second book will have a great deal more action in it, and that this book was a build up for it. I still do want to read the rest of the series because it does sound good. I don't typically say this, but I think I could have skipped this book entirely and read the second book instead. This is a check it out of the library book, not a buying book- at least for me.